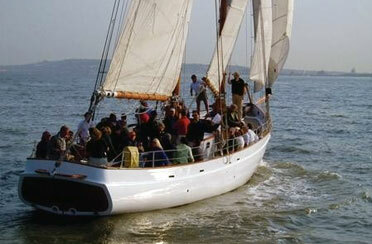 Enjoy a magical evening with us for a Newport Rhode Island full moon sail. Cruise at night for a romantic boat ride and take in the vast sky of twinkling stars and a moon that will leave you breathless. Have you ever watched the Full Moon rise over the Ocean? This is a rare magical Newport RI event. 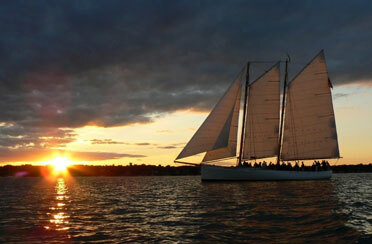 Sail aboard the 80 foot Schooner Adirondack II or Sloop Eleanor under the glow of a full moon off the coast of Newport RI. Romantic and peaceful, snuggle up next to your loved one and enjoy a glass of Champagne. Listen to the lapping of the water up against the hull of the boat and take in the shimmer of the Ocean as it dances in the moonlight of this beautiful once a month event. 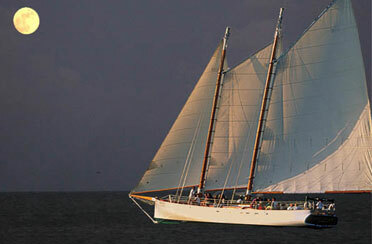 Sailing at night for a Newport Full Moon sail will be an experience that will last a life time. It will be both awe inspiring and breathtaking and you are sure to talk about it for years to come.